Oh my gosh, guys, this hot Asiago artichoke dip is so, so good! It’s made of flavorful Asiago cheese, mixed with artichoke and spinach, and baked into the oven into a hot, gooey, delicious mixture. Just grab pita chips or plain Doritos and get dipping! In case you haven’t noticed, we’re huge fans of dip in our household. Sometimes we go for the healthy dips, like a yummy Greek Yogurt fruit dip recipe, or a low carb chocolate fruit dip. Other times, we love a sweet dip like this tasty cake batter dip, or a lovely caramel apple dip. 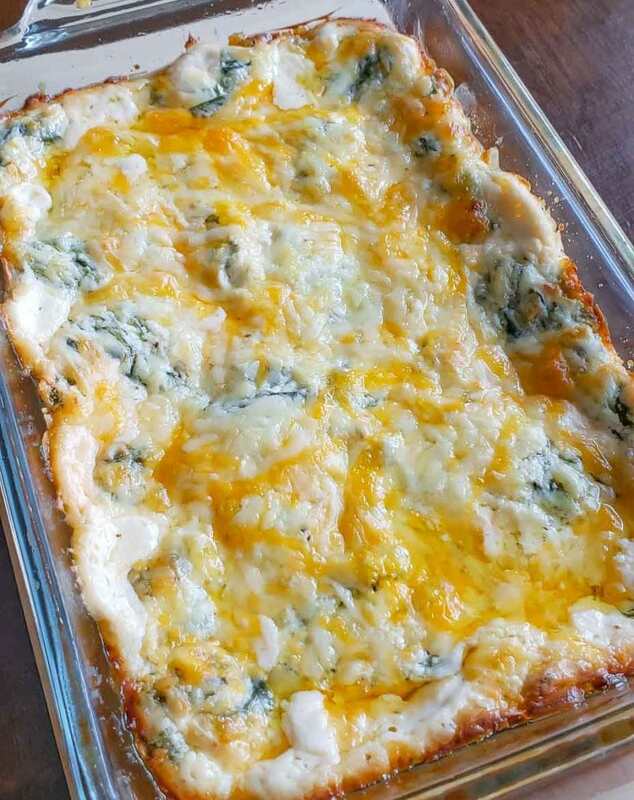 Then again, sometimes it’s time to bring out the cream cheese, full fat cheddar and Asiago, and really enjoy a yummy hot Asiago spinach artichoke dip dip. 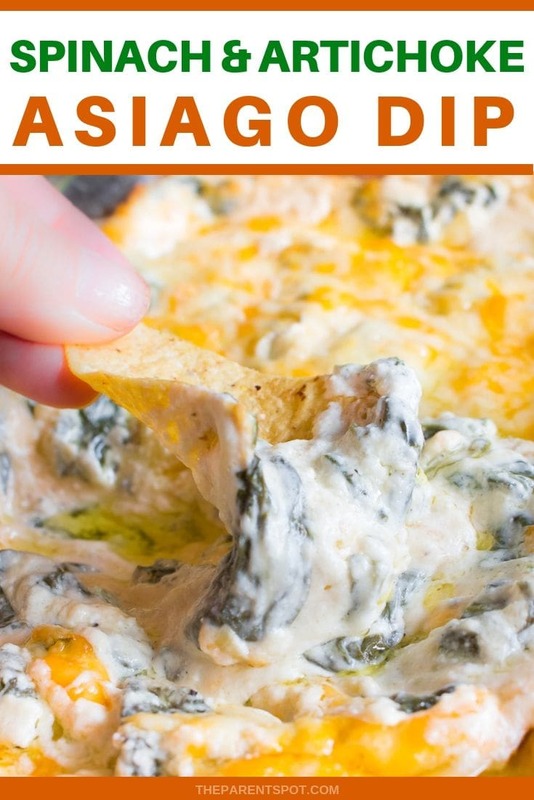 This artichoke and Asiago dip is one of those recipes! Costco sells huge blocks of Asiago cheese, so we always have it on hand. We use Asiago a lot as a substitution for Parmesan, as it’s a lot cheaper than real Parmesan blocks. It’s also delicious! Don’t let the list of ingredients scare you off! This Asiago dip actually easy dip to make! It’s only about 15 minutes from grabbing the first ingredient to getting it in the oven. It’s well worth it! 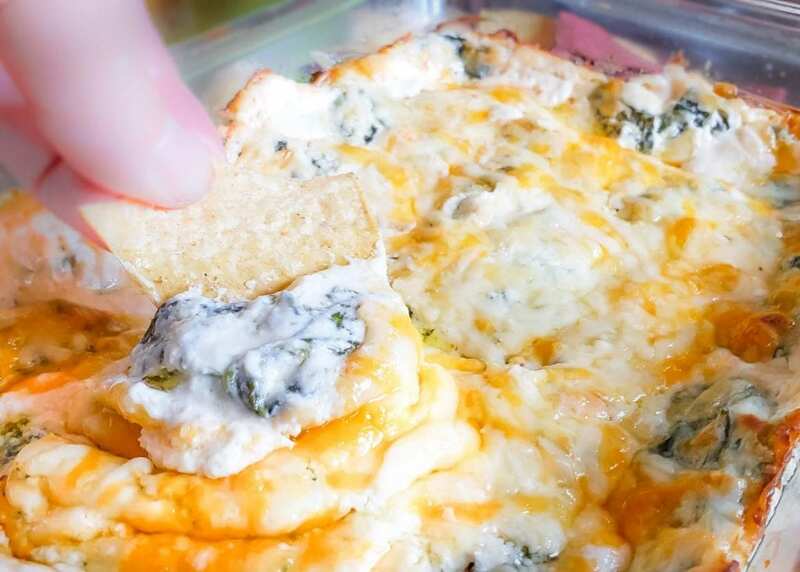 This is such an easy dip to make! Essentially you just add all the ingredients to a bowl, mix, move to a baking dish, and bake! So simple. Lightly grease a 11″ x 13″ baking dish. Tip! 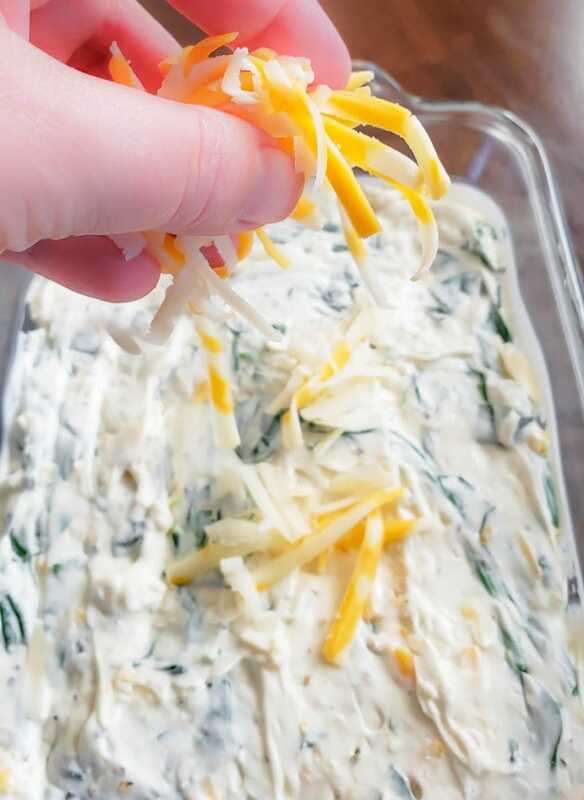 I chopped my artichokes finely in this Asiago cheese dip recipe, but if you love big artichoke flavor, leave them in bigger chunks! Mix cream cheese, mayonnaise, Parmesan cheese, Asiago cheese, drained artichokes, spinach, garlic, basil, garlic salt, salt and pepper in a medium bowl. Add to the greased baking dish. Top with cheddar cheese. Bake in the preheated oven 25 minutes, until bubbly and light brown. Want a light artichoke and Asiago dip? Substitute low fat mayo, low fat cheese, and artichokes packed in water. Looking for a hot Asiago crab and artichoke dip? This is such an easy recipe to adapt – just add 2 six-oz cans of imitation crab meat, drained. Or check out our yummy hot imitation crab dip with cream cheese. We love to serve this tasty artichoke and spinach dip with Doritos, but it’s also delicious with pita chips, a baguette, or pretzel chips. It’s a little to thick to serve with potato chips, as potato chips tend to break off in the dip. I tried it! It’s also nice to cut the richness of the dip with something a little lighter like a pita chip instead. We also love this served with crunchy, thick veggies like carrots and thick slices of red or green bell pepper. So good! Asiago is a semi-hard cheese, that’s a little like Parmesan. It’s made of milk, and tends to be smoother than Parmesan, but a bit creamier and milder. It’s originally from Italy. Fresh Asiago is smoother and milder, while true aged Asiago is harder, and with a stronger flavor. Want more Asiago cheese recipes? Check out our yummy, four ingredient Asiago Alfredo sauce that you can whip up in only ten minutes! 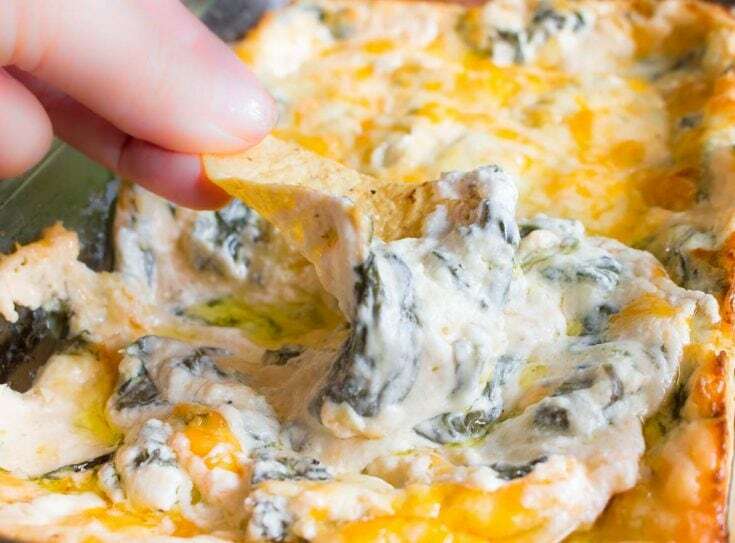 This cheesy dip is perfect for enjoying with pita chips or a fresh baguette. Lightly grease a 11" x 13" baking dish. Mix cream cheese, mayonnaise, Asiago cheese, drained artichokes, spinach, garlic, basil, garlic salt, salt and pepper in a medium bowl. Bake in the preheated oven 25 minutes, until bubbly and light brown. Let cook 10 minutes before eating. Yum! Such a great dip recipe! One of my favorite dips is a Spinach Artichoke Dip sold at Houstons so this is right up my alley. I love how easy it is and a warm dip at this time of year should always be on the menu. I’m keeping this for the big basketball games coming up in March.